If you think of the root of your tooth as a pencil, a root canal procedure is the removing of the lead from the pencil and replacing it with something other than lead. The inside of your tooth has living tissue. This includes a blood supply, lymphatics and nerves. When your tooth becomes infected from any number of causes (a big cavity, fractured tooth, large fillings that are too close to the pulp) it will require that the living portion of the inside of the tooth (the pulp) be removed and filled in with a special filling material called gutta percha. Gutta Percha is basically a rubber like filling material that seals off the inside of the tooth and helps to prevent further infection. After the tooth has been filled with gutta percha, it is usually (but not always) restored with a crown. Occasionally the tooth can be restored with just a filling. Root canal treatment allows you to keep your own tooth, so you don’t have a missing tooth in your smile. Many patients dread hearing the words “root canal”. A root canal procedure should be music to your ears if you are in pain from a dental infection or trauma. 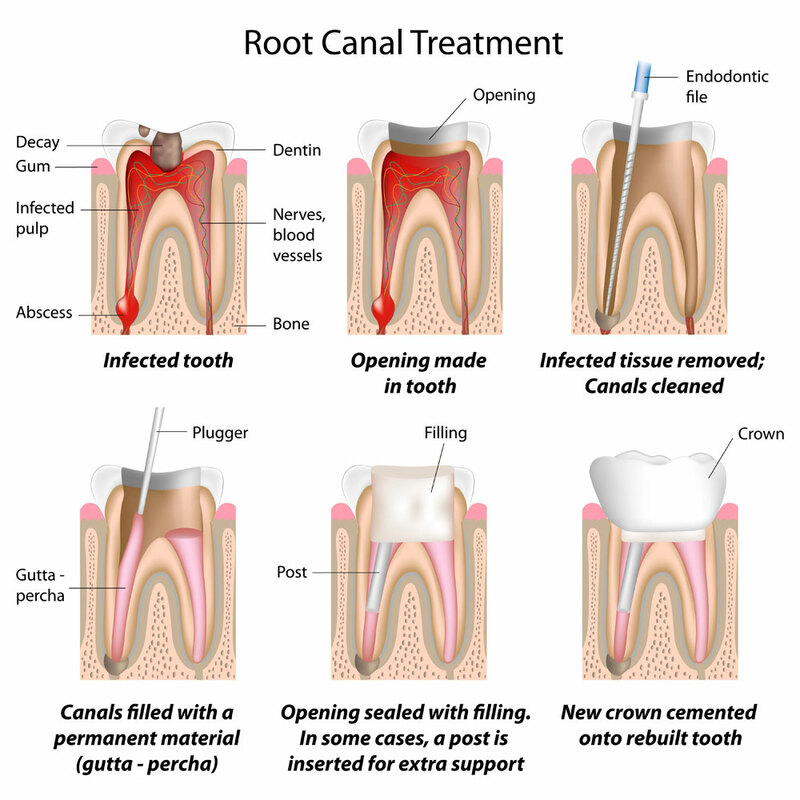 The root canal procedure will remove the nerve from the tooth, and you can get back to your normal life right away. A root canal ends pain, it doesn’t cause pain. Your tooth is getting numb for your relief. A thin and flexible sheet of latex rubber dam over your tooth is placed to make it dry. An opening is made through the crown of the tooth where we are performing the root canal. Any Decay, nerve of the tooth, and all living tissue is removed from the pulp chamber and root canal. We will clean and shape each root canal so that it can be filled later. We may use medicine in the pulp chamber and root canal to help get rid of germs. A Final filling material or a temporary filling is then placed in the opening to prevent contamination of the root canals. If we prescribe medicine, please use it only as directed. There are alternatives to having a root canal. The first of those is to have the tooth removed, and leave an empty space where the tooth once was located. We do not recommend leaving open spaces in your smile, as problems will surely arise from dooing so. The teeth left on either side of the empty space can begin to shift and move, creating malocclusion (bad bite), periodontal problems (bone loss, gum disease) and other problems. The other alternatives are to have the tooth removed, and replace the missing tooth. There are a few ways to replace missing teeth and they include partials or dentures, bridges or implants. If you are a good candidate for dental implants, then this is generally the best option for replacing a missing tooth. Unlike partials or dentures, implants are not removable and act like your natural teeth. Bridges are a good second option, but have some drawbacks compared to dental implants.